Mahlangu handwasher Written on March 26, 2009, by Ingeborg. Which Dutch Design has concurred the world in 2008? 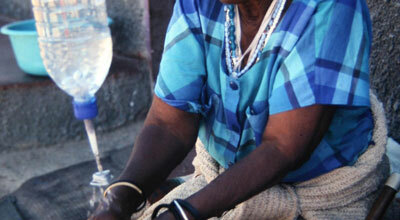 The inevitable storm umbrella but also a surprising project: the Mahlangu handwasher. No conceptual fresh looking form as is expected of Dutch Design. Irene van Peer uses empty plastic beverage bottles. She has devised a clever method for turning these into hand-washing devices to help prevent the spread of disease in Africa. Read more from the Dutch design, Superuse category. Stay up to date via RSS , or Trackback from your site.